The Rhododendron Species Foundation Garden is designed primarily around the botanical collection. Unlike many other public gardens, this one is designed by plant nerds for plant nerds. Ambiance, beauty, and interest are factored into the design, but the primary function of the garden is to provide optimal conditions for the plants. We humans are simply allowed to view the plants living their lives. At the garden, they continuously test and try new plants to see if they will make it. Most plants are identified and many of the plants prospering in the collection are available for sale there as starts. It is so large that at any time of year there is something interesting to see. It is so large that there is always solitude somewhere. The foundation garden seems to specialize in “what the heck is that?” plants. Here is the dwarf Rhododendron species R. proteoides. It’s a weird little species with cool foliage. It also produces very nice flowers that are large and white with pink edges and stripes. The foundation now has a young specimen of the new Rhododendron variety ‘Ever Red’! ‘Ever Red’ has bright and shiny red new growth that hardens to dark red. It also develops blood-red flower clusters. They have a few for sale, but nurseries probably won’t have any available for a few years at least. I have never even heard of this species! It is R. rushforthii, and it has unbelievable clean blue foliage Apparently it offers small flat-faced yellow flowers. I'll have to come back to get a look. I hope it’s cold hardy here! 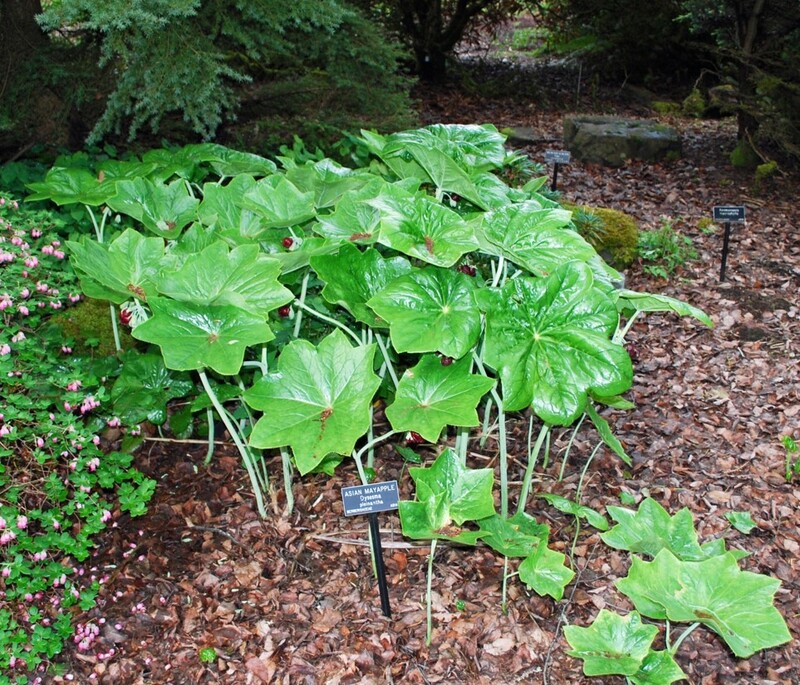 R. griersonianum looks like some big herbaceous tropical plant. Red Flowering Mahonia (Mahonia gracilipes). This is definitely a “what the heck is that plant?” (WHP). It grows little bright red flowers with yellow centers that occur on long stalks. I Love the gnarly leaves and random growth habit. The leaves look like they have sharp edges, but they are all talk. Holy Mackerel! A 100-foot-tall Hydrangea vine! Just for perspective, King Kong was 50 feet tall. There are plenty of other quirky plants as well. 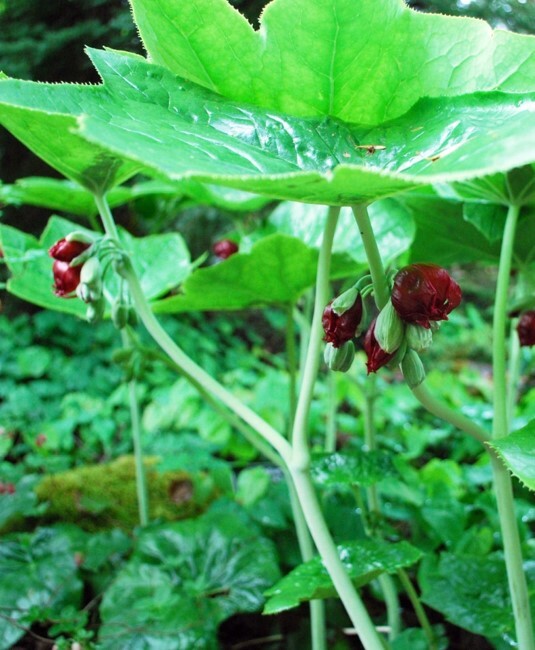 This Chinese Mayapple (Podophyllum pleianthum) has the coolest dark red and awful-smelling flowers. They smell like rotten meat, probably to attract flies and/or beetles as pollinators. My wife knows that I love all malodorous flowers. When I ask her to come down to the ground with me and smell the weird flowers under the leaves, she used to do so. That only worked a couple of times. Now she knows better. Here's an unmarked Mayapple Podophyllum. Sadly, this one’s flowers had a delicate and sweet scent. Japanese Jack-in-the-Pulpit (Arisaema skikokianum). Arisaema are members of the Arum family of plants, along with Skunk Cabbage, and Corpse Flowers, so they are pretty much the coolest around because they often smell terrible. Some Arisaema species can omit some serious funk, but not this one. It does have cool variegated leaves and a large, weird flower though. Not all flowers can smell bad, but as long they are thorny or black, they are still cool. I swore there would never be a place in my garden for a Geranium, but this variety - ‘Lily Lovell’ - is awesome. This is a “bucket list” plant. If you have not met a Cardiocrinum in bloom, you haven't fully lived. Those stalks in the meadow are the remains of last year’s flowers. The stalks can grow 12 feet tall and the flowers at the top of the stalks are huge white fragrant lilies. It takes most of a decade for each plant to build up enough energy to flower. Back to Rhodies. Very large leaf Rhododendrons are all the rage amongst collectors right now. Many of them are not very cold hardy, however, and require protection. I wrap my R. sinogrande in Christmas lights every winter. The image below shows the cool new growth of Rhododendron rex subspecies rex. It has been reliably cold hardy for much of the PNW. The photo on the left is a R. rex fictolacteum specimen that is about 18 feet tall. R. kesangiae is another reliably cold-hardy monster. Look at this! A groundcover Rhododendron with large flowers. Rhododendron pruniflorum has awesome flowers, foliage, and a dwarf growth habit. Here in the PNW we have uniquely mild summers and winters, thus we get to grow and enjoy many special gems others can only read about. Himalayan Blue Poppies (Meconopsis) are a prime example. They are absolutely stunning and they do not like heat, but they need bright light. That’s not a problem around the Puget Sound! This garden has such healthy soil, our native coralroot orchid Corallorrhizae grows wild here. 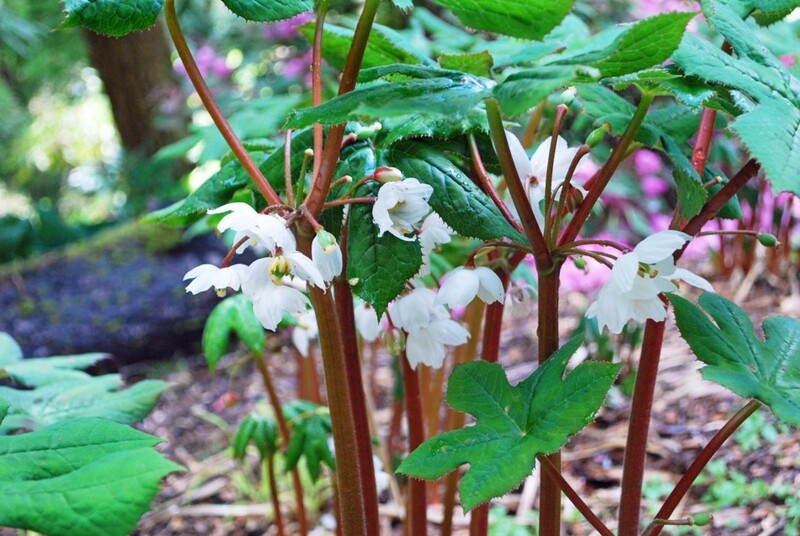 Coralroot are good indicators of soil quality, so If you are ever in the woods in the PNW and are looking to view rare native orchids, you probably won’t find any if there aren’t any coralroot around. Chinese anise (Illicium)is a wonderful evergreen and shade-loving shrub that is very difficult to procure. If you find one for sale, buy it quick and propagate it! Menziesia ciliicalyx Purpurea. We have a Menziesia that is native to the PNW, but it is nowhere near as pretty as this Japanese native. Another forgotten trait are the seeds (samaras) that some Japanese maples develop. This image shows the beautiful bright red samaras of ‘Heptalobum’ Japanese maple (Acer palmatum). 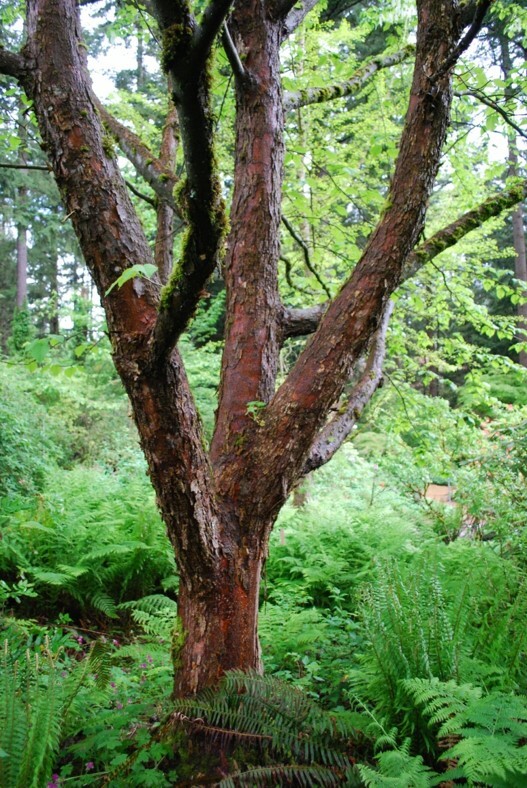 Dove trees (Davidiainvolucrata) are on the Seattle Street Tree List, so plant them right now! Rhododendron ‘Thumbelina’. It’s a little dwarf plant, and the foliage has an interesting musky smell when rubbed. Rhododendron decorum. New foliage emerges bronzy and hardens to green. This beauty has very large flowers that are fragrant, similar to the more common R. fortunei. Rhododendron canescens has a delightful fragrance. Rhododendron fastigiatum. I love this plant. It has nice violet flowers and bluish foliage on a compact plant, but the nerd that I am finds it most fascinating that this plant was named “fastigiatum”. There are scientists who dedicate their existence to categorizing and accurately naming living organisms. Names of species often refer to a particular unique trait that species has relative to other like species. Fastigiate means specifically erect growing, but this plant looks to have very much the opposite growth habit type. Apparently there are different forms of this species, and/or environmental factors may affect the growth habit dramatically, so somewhere out there uniquely upright and narrow Rhododendrons are growing, just not here. Daffodil-like Azalea Rhododendron ‘Narcissiflorum’. Azaleas are a subgroup of Rhododendrons. There can be azaleas that lose their leaves in the winter or ones that are evergreen, but they are all types of Rhododendrons. This beautiful deciduous (loses its leaves) form was named after daffodils Narcissus, because the flowers are reminiscent of daffodils. The flowers emit a delicious fragrance. Well, that about wraps up our tour. Be sure to check out the Rhododendron Species Botanical Garden on your own - the Rhododendrons are starting to bloom! Thanks for following me on my garden adventure. See you soon for another installment.